Sally and I moved from New York City to live in San Francisco to be near our son and daughter-in-law. 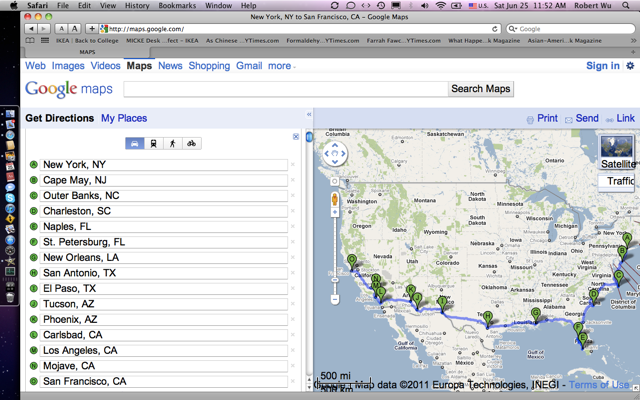 We took a long and scenic route along the Atlantic and Gulf coasts, then through the deserts of SW US and California. Our new Honda Accord coupe performed very well, giving us 35 MPG, more than the rated 33. We chose our route to travel mostly on scenic local roads. We got to visit towns and see America up close. Most Americans live in standard houses like cape cod, split level, ranch, or colonial styled houses. Besides those, we saw distinctly different styles in various regions to reflect local traditions and environments. At the southern tip of New Jersey, Cape May is the first seaside resort of America since 1760. 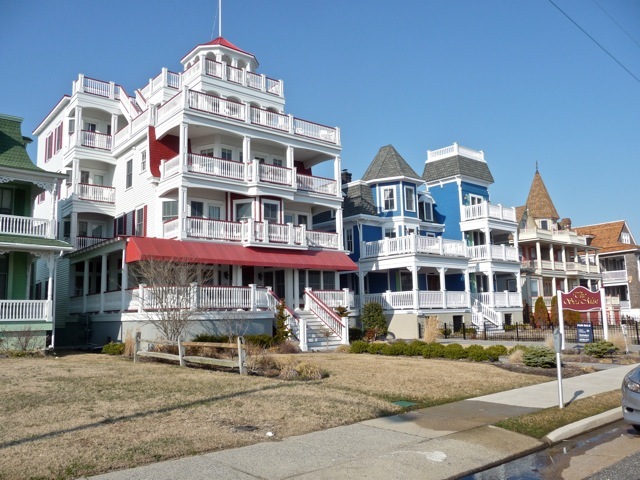 Many of its seaside houses are big old victorian mansions, and it is one of the few places in US where many victorian houses survive. 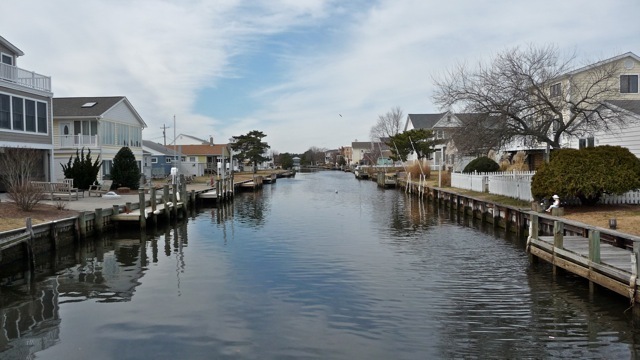 On the lagoon side of the coastal barrier island, canals are cut and houses with boat berths are built for water sport lovers. 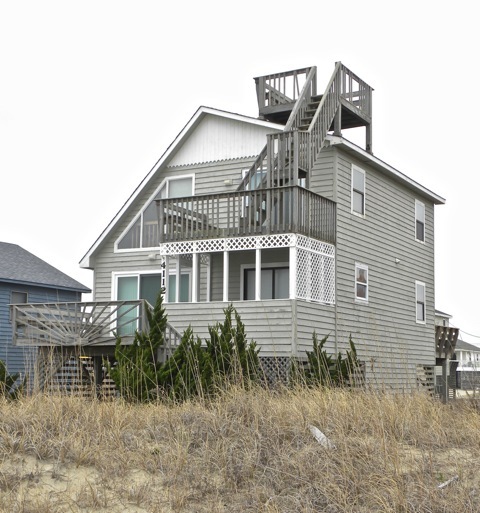 Along the Carolina coast, new expensive houses are replacing older humble beach houses. As in Hong Kong where people long to have homes with sea views, this house away from the shore has a viewing deck built on its roof for a glimpse of the sea. This Virginia farm house is nicely framed by two rows of flowering trees. The family may have grand vision of themselves living in a plantation mansion in the deep South. An old Virginia farm house saw better and more productive days. 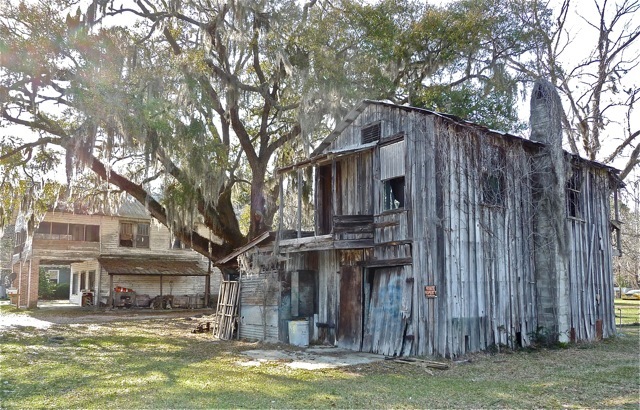 Trees in Southern states are often draped with Spanish moss that make them look creepy and moldy. Surprisingly, Spanish moss are dry clumps of stringy air plant that are pleasant to touch. 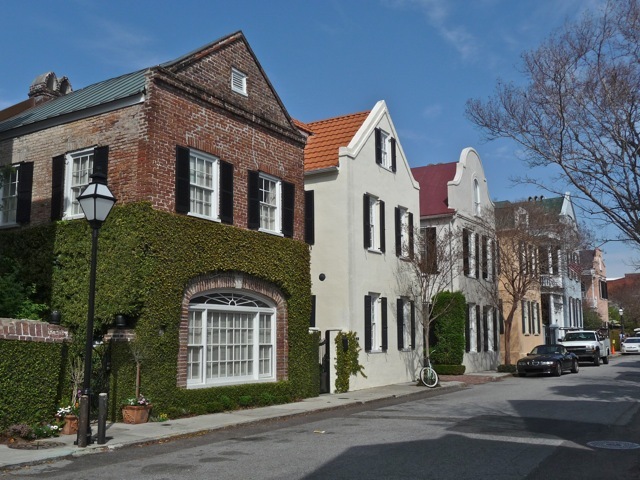 The lovely city of Charleston, South Carolina, is rated the second most attractive city in US, just behind San Francisco. Its charm stems from its large neighborhood of well preserved old houses, a few from the colonial days. Well restored and maintained old houses are lived in by families, giving them liveliness instead of being dead museum pieces. 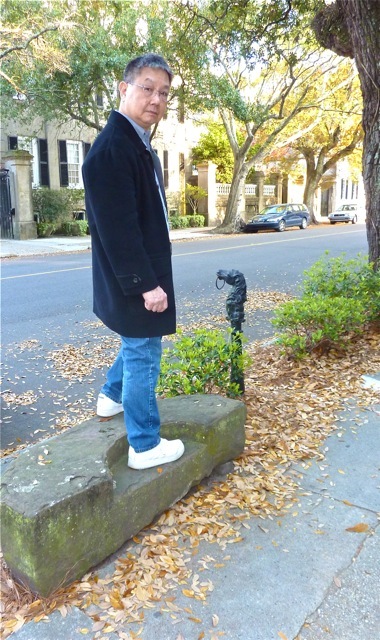 I stood on a stepping stone used to mount a horse, next to a hitching post used to rein the horse. 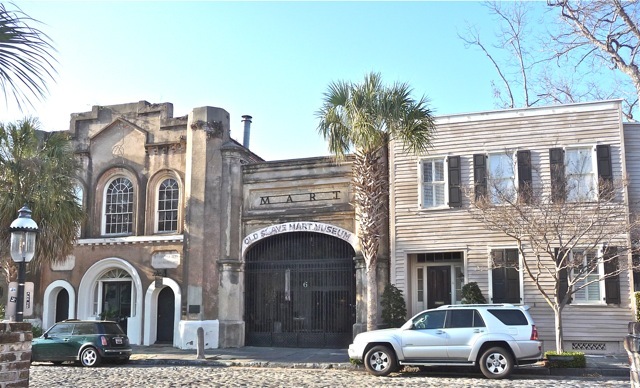 This building was a market for Black slaves, emancipated in 1865 after the South lost the Civil War. Florida is the winter home of “snow birds”, Northerner who go south in the winter to escape the cold and the snow. From the rented apartment of a friend, St Petersburg looks very inviting. If we were living in New York, we probably would go and live in Florida during the coldest months. The Gulf states are often hit by hurricanes and the coasts are often flooded. 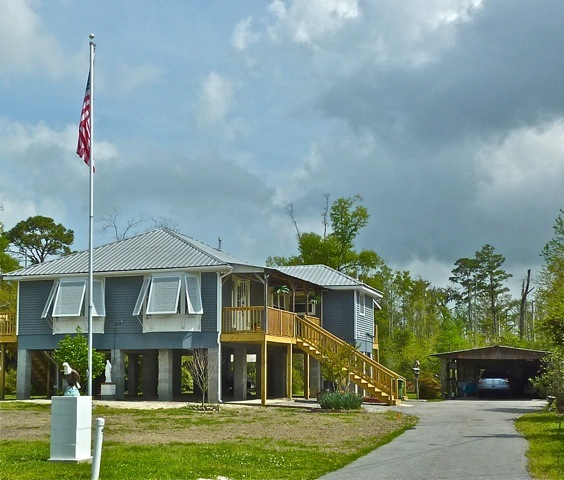 This Mississippi house is built on stilts to avoid damage from periodic floods. Hurricane Katrina devastated New Orleans in 2005, breaching dikes and flooding large areas of the city. 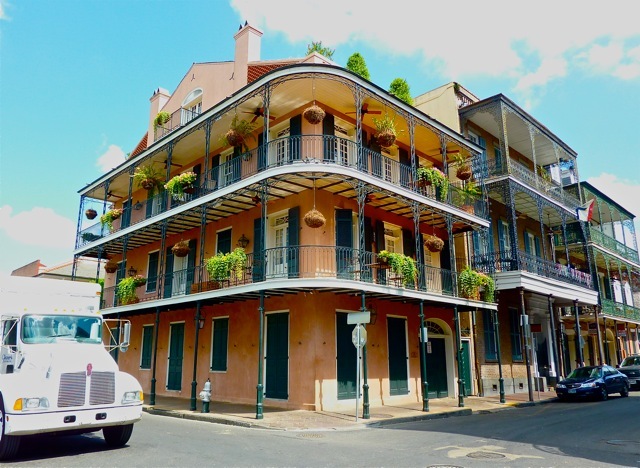 The city slowly rebuilt itself, and the famous French Quarter has mostly recovered its charm. But when we visited French Quarter 25 years ago, it was much more vibrant than this time. Many New Orleans neighborhoods remain devastated and vacant of residents. 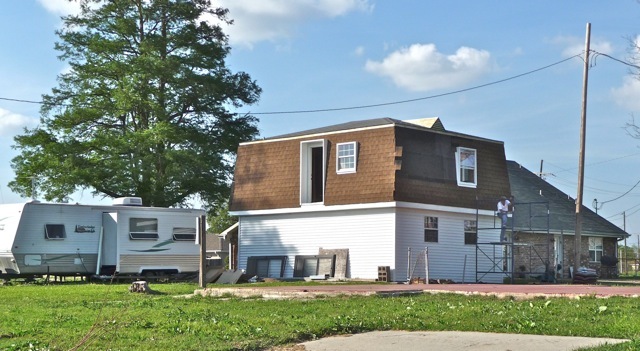 This damaged house is being repaired and the trailer serves as a temporary home. Some towns are destroyed not from natural disaster but by acts of man. As interstate highways were built in the 1950s, towns were bypassed and died as traffic no longer take the slower local roads. 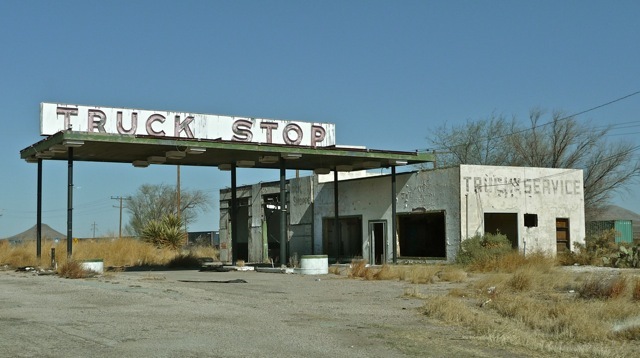 This truck stop went dead when there were no more trucks. Old motels in old towns also went out of business when better managed motel chains proliferated. 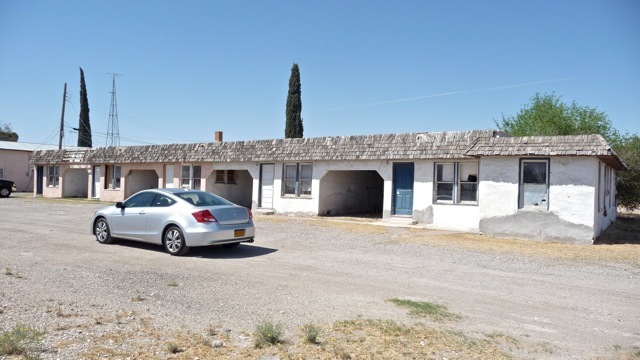 This defunct old motel offered car ports next to guests’ rooms, and is a relic of slower days. In Texas, we visited the American national shrine of Alamo. US history records it as a battle of Americans fighting for independence from an invading Mexican army. Actually, Mexico invited American immigrants to the Mexican territory of Texas, but the new arrivals staged an insurrection and held the Alamo as a rebel base. The Mexican army suppressed this armed rebellion by American immigrants to protect its national sovereignty. With this history of American immigrants overtaking land from Mexico, no wonder many Americans worry about the large number of Mexicans immigrating to US, especially Texas and Arizona. Americans don’t want a reverse Mexican Alamo sometime in the future. 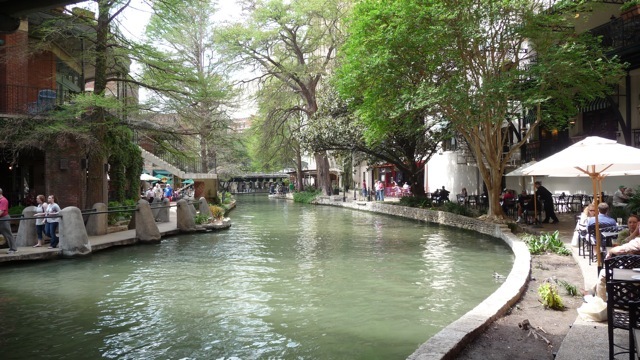 The city of St Antonio where Alamo is located has a peaceful and paradise-like river running through the center of the city. It is below street level, and its banks are covered with trees and crowded with restaurants. Taking a walk along the banks is a pleasant reprieve from the dusty traffic of the streets. After US extracted Texas, New Mexico, Arizona and California from Mexico in a war, US encouraged settlements in those sparsely populated Indian lands. The Native Americans objected to the disruption to their way of life and resisted settlements. In the late 1800s, most of US army was used to fight Indian resistance. 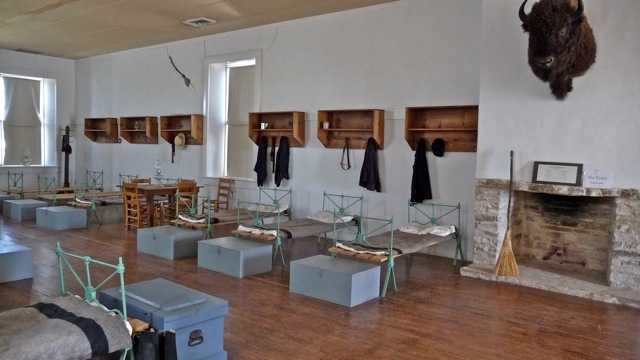 This is how soldiers lived in barracks when they were fighting Indians. Sometimes soldiers break rules and were punished. 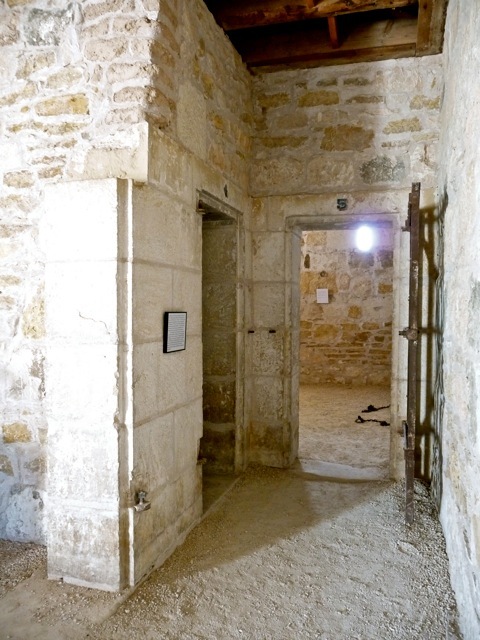 They would be kept in jails and shackled to the wall in a guardhouse. Arizona and New Mexico has very little rain and are mostly desert lands. 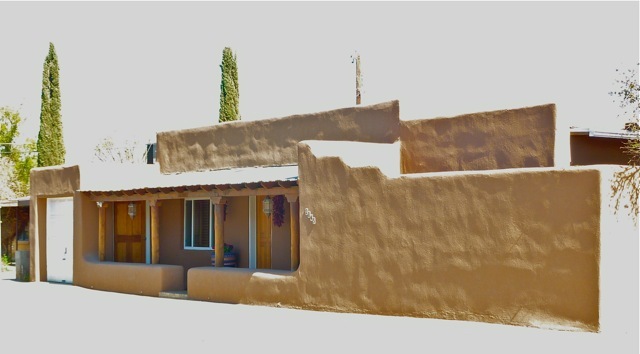 Houses were built with adobe bricks (mud mixed with sand and straw) and have a distinctive style. They are relatively cool under the sun and their flat roofs can withstand the little rain that fall. 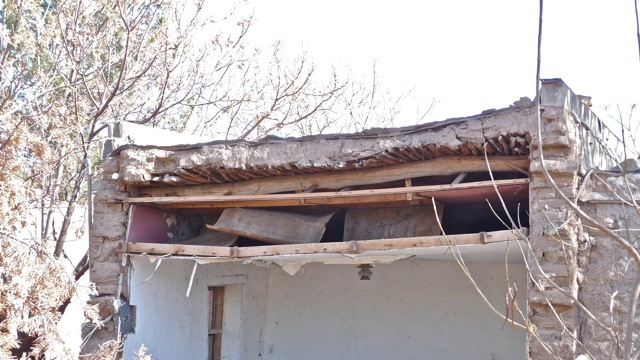 This broken adobe house demonstrates the construction of an adobe house. Adobe walls support strong beams which are laden with closely packed sticks. Then six to eight inches of adobe material are piled on top of the sticks, forming a water tight roof. 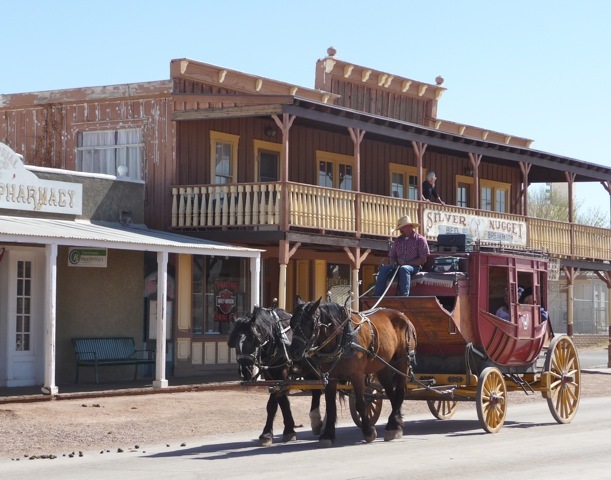 When a rich silver vein was discovered in Arizona, the boomtown of Tombstone sprang up in 1880. This town was the legendary site where outlaws and smugglers called “cowboys” fought law men such as Wyatt Earp. Today, the old-looking building are newly built to attract tourists. The single house from those lawless days is a saloon and gambling house. Dozens of bullet holes have been found in this one room. 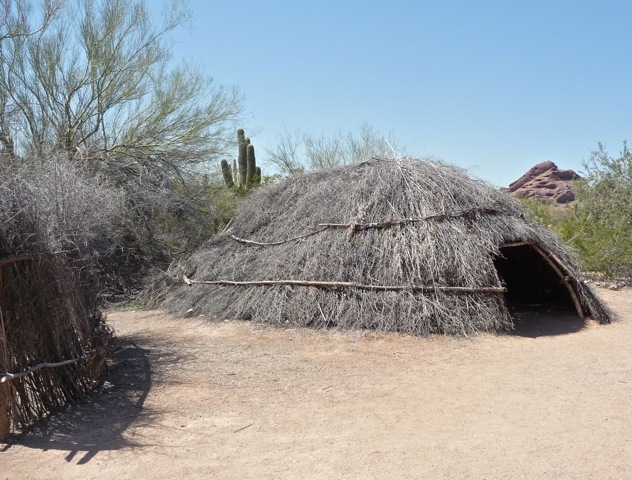 Native Americans lived in the desert and used available materials and foods. This is a recreated shelter of the desert Indians. San Diego area of California has the best weather of all USA. The temperature is moderate all year and the environment is beautiful. It is the most desirable place to live and retire in. After 5,500 miles, we finally arrived San Francisco. 20% of its population is Chinese Americans, and I hear more Cantonese spoken here than anywhere else in America. With a population of less than one million, it is to New York as Macau is to Hong Kong. Perched on a hilly peninsula between the ocean and a large bay, it has lovely neighborhoods and a tradition of tolerance. In fact, it is the capital of the gay population in the US. 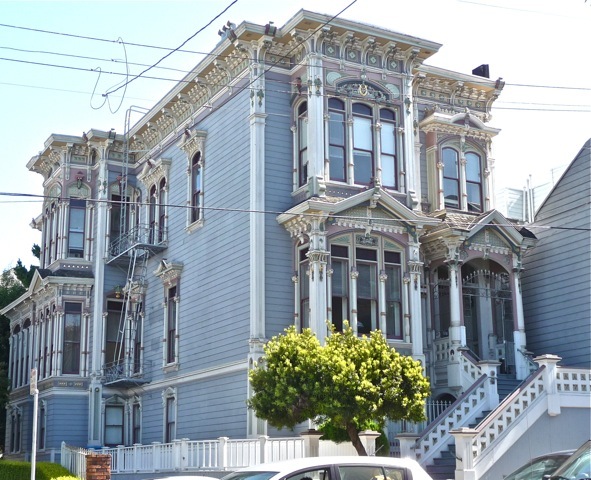 San Francisco is famous for its many lovingly restored victorian houses. Owners spend tens of thousands dollars to carefully paint the exterior of their houses. With more colors used, larger size, and more elaborate decorations, the price of painting one such house goes up exponentially. 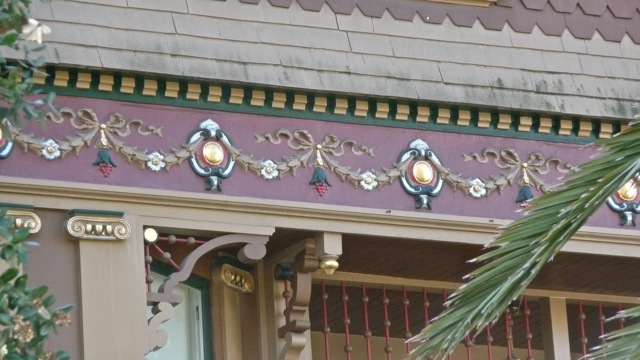 This large house is elaborately decorated with architectural elements, and they are accentuated and detailed. It probably cost the owner of this house $20,000 to paint it so well. The care and artistic effort put into painting this house can be seen in the wall over the main window. 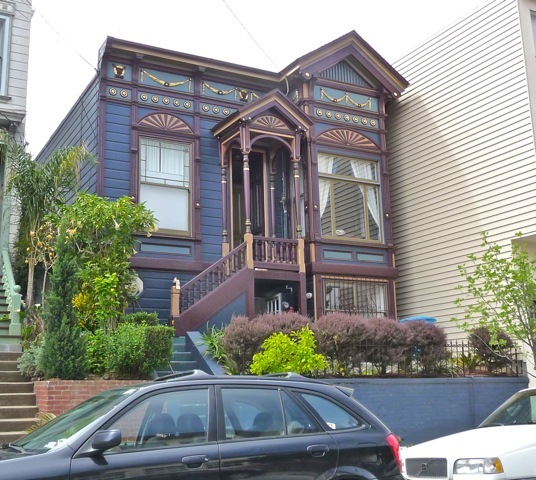 This is another example of the great length owners go to paint their victorian houses. 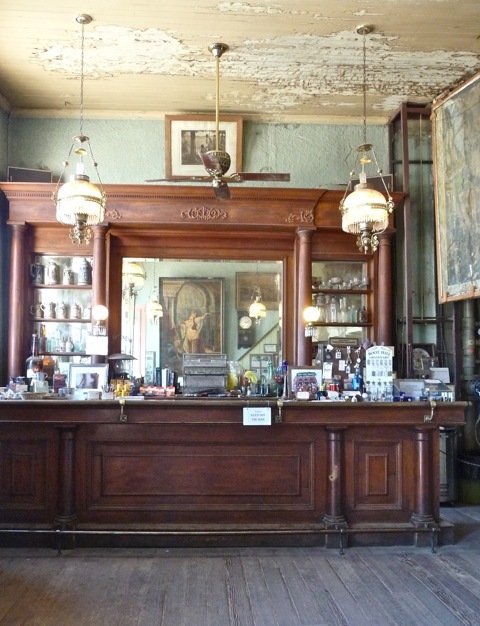 For us, living in San Francisco is like living in a museum of victorian houses. 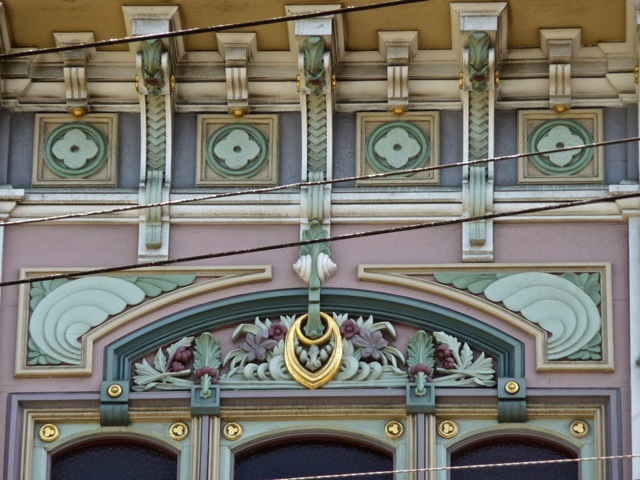 We always find wonderfully decorated houses and we would marvel at their beauty. Posted by Robert Wu on Thursday, July 7, 2011, at 10:55 pm. Filed under Uncategorized. Follow any responses to this post with its comments RSS feed. You can post a comment or trackback from your blog.